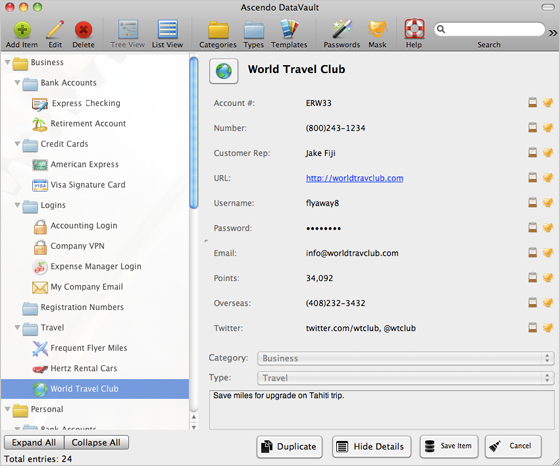 DataVault Password Manager for Mac stores confidential information related to credit cards, bank accounts, logins, memberships, etc. using Advanced Encryption Standard (AES), the most powerful technology for securing data. DataVault provides comprehensive password management for individuals and businesses. DataVault includes unique features such as web form autofill (Firefox), automatic backups, advanced security settings and synchronization with DataVault for iPhone, iPad & iPod Touch or DataVault for BlackBerry. 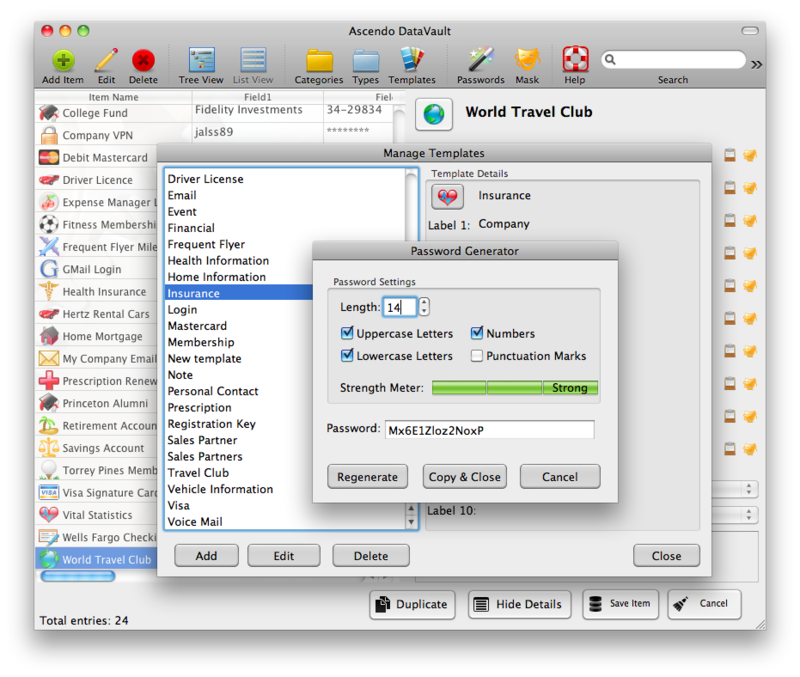 Powerful features and ease-of-use have made Ascendo DataVault the leading password manager for Mac. 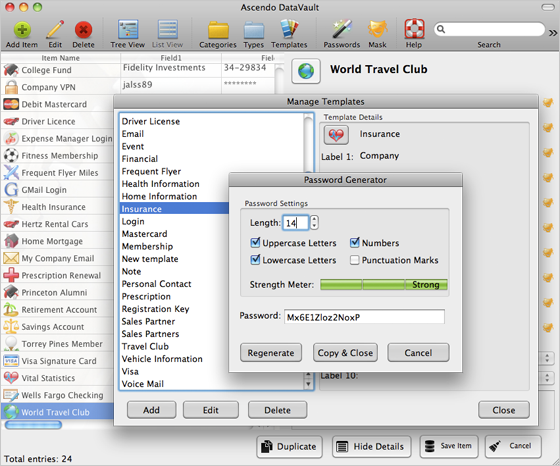 "Everything I wanted in a Password Manager! Great design and lay out! Easy to use. I like everything about this app! It looks great on my iPad, it works great on my Mac! It has every feature I was looking for in a password manager and then some. The customer service is amazing!" 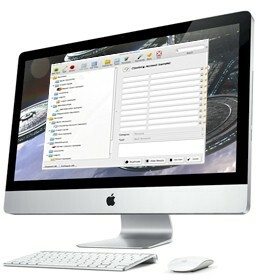 Protects confidential data using powerful encryption and advanced security features. Saves time and money by giving you instant access to your private information. Adapts to your needs by providing numerous customization options and personalization settings. Display items in folders, similar to the Mac Finder. Expand and collapse all tree levels. Display items in list. Hide item form to increase viewing space. Advanced browser integration. Firefox add-on provides ability to autofill web forms, save web forms and pop-up password generator. Enable automatic back-up and choose file location. Click for full screen image. Synchronize items with DataVault for iPhone, iPad & iPod Touch and DataVault for BlackBerry. Select sychronization settings to resolve conflicts when an item is edited on more than one device. Choose between several synchronization methods including Mobile Me, Webdav servers, Wi-Fi and data cable. No other password safe offers as many options. Password generator with settings for length and types of characters. Strength meter to determine if passwords are weak, good or strong. Define an unlimited number of Categories such as Personal, Business, etc. Define an unlimited number of Types such as Credit Cards, Bank Accounts, Logins, Memberships, Prescriptions, Vehicle Information, etc. Find items quickly. Type characters to reduce list to matching entries. Filter items by category or type. Set security timeout to require master password after inactivity delay. Mask and unmask fields to protect information from prying eyes. Set maximum login attempts before auto-destruct. Associate icons with Items and Templates, 100 icons to choose from. Backup and Restore data in encrypted, secure format. Import and Export data in DataVault Exchange (*.dvx) format. Exchange data files with DataVault for Windows. Import and Export from text files in comma separate value (*.csv) format. 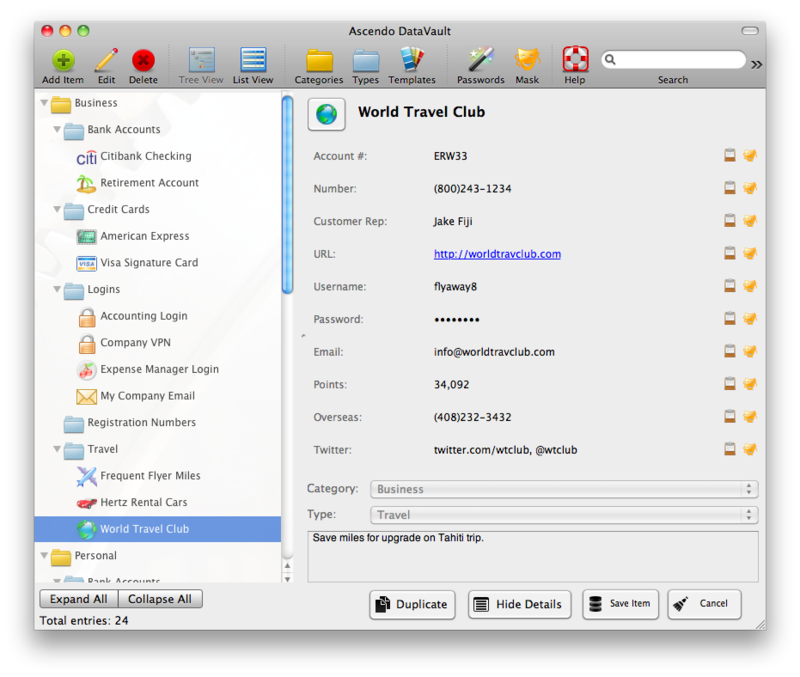 Import from 3rd party applications such as 1Password, mSecure, SplashID, eWallet, Turbo Passwords, etc. using pre-defined CSV formats. "Very useful and reliable password manager. Syncs perfectly between the Mac and the Blackberry. Very responsive technical support. I like everything about this application." Protect your data with Advanced Encryption Standard (AES), the official recommendation of the National Institute of Standards & Technology (NIST). Why is this important? The National Institute of Standards and Technology (NIST) chose the Rijndael algorithm as the new Advanced Encryption Standard (AES) over alternatives including Twofish (successor of Blowfish), Serpent, RC4 and MARS. The announcement concluded a multi-year effort working with government, industry and academia throughout the world. Proposed by two Belgian cryptographers, AES has emerged as the clear winner and has since been adopted as a worldwide standard. For more information, click here. Ascendo DataVault for Mac requires Mac OS version 10.5 or above and 5 Meg of free disk space. Download DataVault with 30-day Free Trial now! DataVault for Mac is currently on sale for $9.95, 50% off of the list price of $19.95. Other promotional offers may be found on our Facebook Page. Copyright © Ascendo Inc. All rights reserved.